Acrylic Displays are perfect for any retail store wanting to show off products or promotions. Over 350 display choices from Grid wall to Slat wall from countertop to jewelry displays, you will find what you need to display your products. Countertop Displays are perfect for displaying smaller products right on top of your counter. Display multiple products with the Mini Platform Stairs or display bottles of perfume with the Vertical Acrylic Tower. Display your promotions, coupon books and other company information with an Acrylic Literature Display. From wall-mounted to counter top displays you will be able to find the perfect Acrylic Literature Display for your retail store. 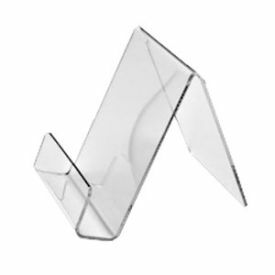 Clear Acrylic Risers are made so that you can display your merchandise at different heights. You can add lots of interest to your retail store's displays with very little effort. You do not need to be a designer to create good looking displays when you use a variety of risers. You can choose Clear Acrylic Risers that will make your products show up the best between round, square, rectangle, or mirrored risers. If you don't see what you need, contact a Product Expert. Clear Acrylic Display Shelves, J Racks & Trays are perfect for showing your product effectively. Clear acrylic display shelves will highlight your product rather than the display itself. Choose from slatwall, gridwall, wallmount shelves or counter top displays. We also design and produce custom acrylic shelf displays. These are deluxe Acrylic Display Trays and are perfect for countertop displaying and showcasing merchandise and collectibles in your retail store. These Acrylic Display Trays and Bins are perfect for gift shops, antique stores and more. Acrylic Apparel Displays will help show-off your apparel products with ease. From scarf rings to apparel hangers for slatwall, give our apparel shop that Je ne sais quoi you have been wanting. And to help fold the T-shirts for T-Shirt Displays there are folding boards. From sunglasses to readers and everything in between, American Retail Supply has what you need to show off those eyewear products with Acrylic Eyewear Displays. Perfect for boutiques and ophthalmologists’ offices. Display all the pretty jewelry with ease with an Acrylic Jewelry Display. From Watches to Earrings there is an Acrylic Jewelry Display perfect for your products to be displayed properly and proudly. Acrylic Cubes and Cylinders are perfect for showing of a collection of pieces. The Cylinders come with 3 sizes giving a tiered look. While the Mirrored Cube can reflect your products on 4 sides and presenting one product on the top, giving a beautiful display to your product collection. Acrylic Specialty Products come in all shapes, sizes and display types. Choose from an ornament stand to a glass dome display, find what you need to display your products with a unique acrylic display. No matter if you have a Slatwall or a Gridwall there is an acrylic display for you. From Bins and Trays to T-shirt Displays you will be able to display your products with ease.